The Canon Digital IXUS 100 IS (also know as the Canon PowerShot SD780 IS) is the slimmest ever Canon compact camera, measuring a mere 18.4mm thick. This 12 megapixel model has a stylish ultra-slim metal body, 3x zoom lens with Optical Image Stabilizer , 2.5 inch LCD screen with optical viewfinder, and new Smart AUTO mode. Face Detection, Blink Detection plus Face Self-Timer and Auto Red-Eye Correction technologies promise to capture better people shots, and the Canon IXUS 100 also features a 720p HD Movie Mode with a built-in HDMI connector for playback on HD widescreen TVs. 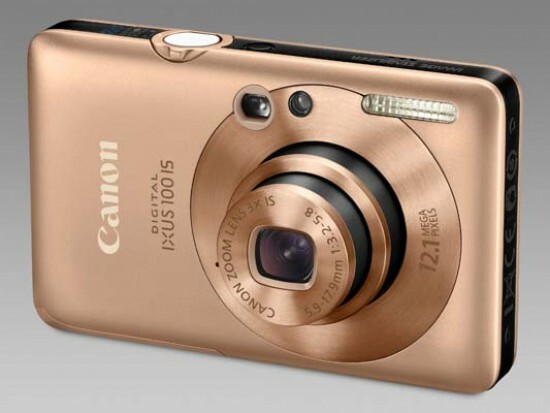 Available in black, red, silver or gold, the Canon Digital IXUS 100 IS officially retails for $279.99 / £299.00 / €349.00. Canon's point-and-shoot Digital IXUS range has consistently been as much about style as performance, and as such, coupled with a mainly metal build and rechargeable lithium ion batteries, they have tended to command a price premium over plainer plastic build PowerShot range models with similar headline specifications but AA batteries for power. Barely larger or fatter that your credit card at 18.4mm 'wide', Canon's latest Digital IXUS in the 100 IS ('Image Stabilised') sports a design, with its subtly soft lines and rounded off corners, to makes the eyes light up with anticipation. The perfect travel camera, perhaps? 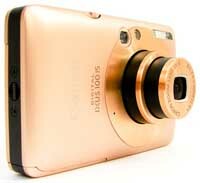 Well, its manufacturer is claiming the camera as its slimmest ever IXUS, and resting it in your outstretched palm it certainly looks the cutest, with a choice of silver, black, orangey-gold or deep red finishes. However the Canon Digital IXUS 100 IS won't stay looking this pretty for long, the metallic finish of the front plate proving prone to scuffs and scratches over the two week period of our assessment. Sure to appeal as much to teenage girls and young women searching for that all-important 'bling' as it is city bankers or lawyers looking magpie-like for an attractive accessory for their top pocket, the focus here is on beginner targeted user-friendliness. Thus the 12.1-megapixel model features the debut of what Canon is calling its Scene Detection/Smart Auto technology – which appears to be a very close relative of the Intelligent Auto functionality found in Panasonic's Lumix series. Setting the 100 IS to Smart Auto mode, the Canon Digital IXUS 100 IS selects from one of 18 optimised choices depending on the scene and conditions it's presented with. It makes this selection, claims Canon, based on subject brightness, contrast, distance from the lens and overall hue. Keeping operation pulsing along is the inclusion of the latest Digic IV processor, as featured in Canon's latest DSLRs. This also powers handholding functions including Motion Detection, aiding capture of moving subjects whilst avoiding blur, plus iContrast, which lifts shadow areas of an image to even out exposures, face detection plus blink detection, face self timer and, as usually found on entry-level Canon models, auto red eye correction. Less expected perhaps at this level is a feature also becoming increasingly ubiquitous among DSLRs, namely a built-in HDMI (High Definition Multimedia Interface) port for connecting the camera up to a latest generation TV set, plus, here, the ability for the IXUS 100 IS to shoot widescreen ratio HD movie clips at a not-quite-Full HD resolution of 1280x720 pixels, but a smooth frame rate of 30 frames per second nonetheless (one of the major points of difference between this and the 95 IS model released alongside). Also welcome is the fact that users have access to the full extent of the image-stabilised 3x optical zoom (rather than just a digital variety) when shooting video. Despite its diminutive size the Canon Digital IXUS 100 IS camera additionally features an optical viewfinder window above its 2.5-inch 4:3 ratio LCD, giving users a choice for shot composition. All of the above goes some way to justifying the IXUS' £299 price tag, which, while not cheap, feels fair. With battery and required SD or SDHC media card loaded, the latest Canon snapshot feels reassuringly weighty in the palm and well-built too despite its near microcosmic dimensions, mixing metal and well-disguised plastic to winning effect. So, with the above in mind, let's take a tour of the Canon Digital IXUS 100 IS's features and functions. At the front the IXUS 100 is an exercise in minimalism, whilst at the same time recalling 'classic' IXUS designs from the series' original APS film incarnation – something to do with the concentric circles (here of brushed metal) surrounding the lens perhaps, and the inclusion of that optical viewfinder. Whatever, it looks like a camera should, whilst at the same time remaining pretty enough to be considered a fashion accessory thanks to the lens itself being hidden within the body when not in use. Top right of the lens is a thin lozenge shaped sliver of a window housing a built-in flash bulb, whilst to the left is a porthole-shaped window housing the indicator light for the self timer/AF assist lamp. Next along is a tiny window for the optical viewfinder, whilst directly below, and barely visible – as it resembles a pinprick – is a porthole for the built-in microphone. The top plate of the camera is similarly refined in appearance, controls set into a different coloured 'go faster' strip that runs around the exterior of the camera so that none of them actually protrude and spoil this IXUS' straight lines. Indeed the shutter release button has had one of its rounded corners tapered to 'fit'. It's encircled by a spring loaded zoom lever with a small lip protruding to the front where it falls handily under he forefinger for quick operation. Moving to the left we find a similarly recessed and much smaller on/off power button, and, to the left again, a grouping of three holes for the built-in microphone. Press the power button and the 100 IS readies itself for the first shot in barely more than a second. While busy scenes can add confusion, it's equally quick to determine focus and exposure with a half press of the shutter release button. With a full press, full resolution still images are committed to memory in a fairly standard three seconds, the screen momentarily freezing and displaying the captured shot while this is taking place. While the left hand side of the camera – if viewed from the back – is devoid of any features apart from small screws top and bottom, the right hand side adds merely a means of attaching a wrist strap. Things get more interesting with an examination of the back plate, dominated as expected by that aforementioned 2.5-inch LCD monitor, with a teeny tiny window for the optical viewfinder ranged directly above, nestling alongside a pair of built-in indicator lights. Since the view delivered by the optical viewfinder is so small and murky it requires the user to squint, I can see most users quickly forgetting about its presence entirely. The top right hand corner of the IXUS' back features a clever incorporation of A/V out, USB and HDMI connections; basically their flip-open plastic cover forms part of the back itself. Beneath this is a three-notch slider switch for the camera's various shooting modes that mirrors that provided on the simultaneously-released IXUS 110 IS. Running from top to bottom are the unit's 'smart' auto mode, regular program auto and, lastly, video mode. Neatly mirroring the shape and size of this control, and ranged to the left, is a familiar playback button, while below is a four way directional control pad for tabbing through menu options and captured images, with a familiar function/set button at its centre. Press the latter when in basic auto mode and a L-shaped toolbar that will be immediately familiar to Canon compact users appears down the left hand side and across the bottom of the screen. In auto, all the user has access to from this is the ability to alter image size and ratio, from 12 megapixels down to 640x480 pixels, and from 4:3 ratio to a widescreen 16:9 with minimal drop in resolution to approximately nine megapixels. Flip the shooting switch to program auto meanwhile and, via the same toolbar, the user additionally has access to pre-optimised scene settings (the standard portrait, night snapshot, kids & pets, indoor or sunset settings). Also available for manual selection are the camera's range of ISO settings, ranging from ISO 80 to 1600, white balance, the regular Canon 'My Colors' effects – including the ability to bias red, green or blue separately plus a custom option – plus evaluative, centre weighted or spot metering. Here too is the ability to switch from single to continuous shooting. The last capture option among the trio is for shooting movies as noted, which also – unusually for a video mode – provides access to manual white balance and 'My Colors' options. Crucially, there's the choice to adjust the capture quality from humble 320x240 pixels at 30fps, through the standard definition 640x480 pixels, and up to an HD 1280x720 pixels, at which points the black bands cropping each side of the view presented by the LCD screen (to provide a 4:3 ratio) drop away to present a 16:9 image. Though a 4x equivalent zoom is provided in video mode, unfortunately it's of the digital variety, so by using it you're compromising on quality. Returning to the function pad and four-way directional controller. At north, south, east and west around this are, in that order, a means of leap-frogging bunches of images when in playback mode or adjusting exposure compensation (+/- 2EV) when in capture mode. Next, at the bottom of the pad, is a means of deleting duff images on the fly or selecting the self-timer options, whilst the ability to adjust the flash settings and switch focus from infinity to macro (and back) complete the package. Below these are a self-explanatory final pairing of buttons – marked 'display' (with an initial press turning off the shooting icons littering the screen, and the second the LCD itself) and 'menu' respectively. Pressing the latter brings up two folders on-screen – the first containing the shooting menu, the second the more general purpose set up menu.The first folder contains the ability to activate the digital zoom, call up grid lines on screen, i-Contrast, image stabilisation modes (continuous, shoot only, active when panning, or off), plus face and blink detection. The second available folder contains the set up menu, offering the ability to tweak various sound and start up options – for once on a Canon compact, there's not an extraneous separate menu folder for doing this – plus format the SD or SDHC card in use. The base of the camera meanwhile features a familiar screw thread for attaching this IXUS to a tripod, plus a sliding door protecting both the SD/SDHC card port (with no internal memory to fall back on) and slender rechargeable lithium ion battery, good for an underwhelming but not disastrous 210 shots from a single charge.